Decent hotel but spoiled by bed bugs! Check-in was very slow, staff tends to congregate around a terminal the move en masse rather than attend individually to guests needing attention. The check-in staff appears generally to have no idea what they are doing and are very inefficient. Regularly, room types which have been booked are not honoured - usually accompanied with "we're now full" - so the double room becomes a twin, etc. This is not a one-off as I have stayed at this hotel about 30 times over the last few years - this is when all other London options have been exhausted. Despite being a Diamond HH member I have only ever had one upgrade - other Hiltons honour the loyalty scheme and upgrade as a matter of course. The standard rooms are very, very small. It is rather like staying in a touring caravan with the sliding door to the bathroom and the very shallow wardrobe. The 'bathroom' is tiny. There is no suitcase stand as there is no room to put one, a suitcase has to be placed on the desk or on the chair. The doors to the rooms tend to not fit very tightly so they rattle when people pass. The rooms are clean and the furnishings in good order but there isn't room for the amount of furniture shoe-horned into the room. Room service menu is quite restricted and not for the healthy eater (lots of fried/junk/pizza) but is very prompt. The breakfast restaurant staff are functional rather than obliging - there is one rather large blonde-haired female member of staff who tends to push into guests as a hobby muttering expletives as she does so. 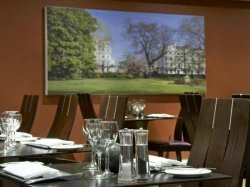 The hotel is not best placed for Central London but there are two tube stations within walking distance and, if you are not in a hurry, there are buses into London. There is a nice, spacious executive lounge which does in some way redeem the hotel but overall it isn't first on the list of places to stay. Just to be clear (as there appears to be some confusion between the Hilton Olympia and Hilton Kensington on this site) this review is for the Hilton Kensington. Where is the Hilton Hotel located in Nottingham United Kingdom? The Hilton Nottingham is located at 38 Milton Street in Nottingham. If one requires driving directions, they can be found on the hotels website. These directions are both written out and shown on a map, both can be printed off if needed.